The Deluxe Afro Clown Wig is made of 100% kanekalon fiber on a stretch knit cap. Completely washable. Available in Brown, Blonde, Blue, Orange, Pink, Green, Purple, Yellow, White, and Black. The wig features an elastic band on the inside for comfortable one size fits most sizing. The Deluxe Afro Clown Wig is an indispensable accessory for disco costumes or a wild and wacky wig for clowns! 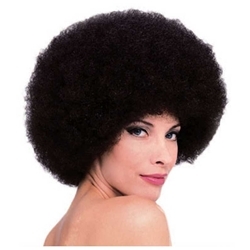 Afro hairstyles were popular throughout the 70's and with the Deluxe Afro Clown Wig, you can recreate the look effortlessly!